Crispy hasselback potatoes are one of the easiest ways to ensure you have crunchy baked potatoes every time. Plus, they are easy to stuff to make them extra special for entertaining. 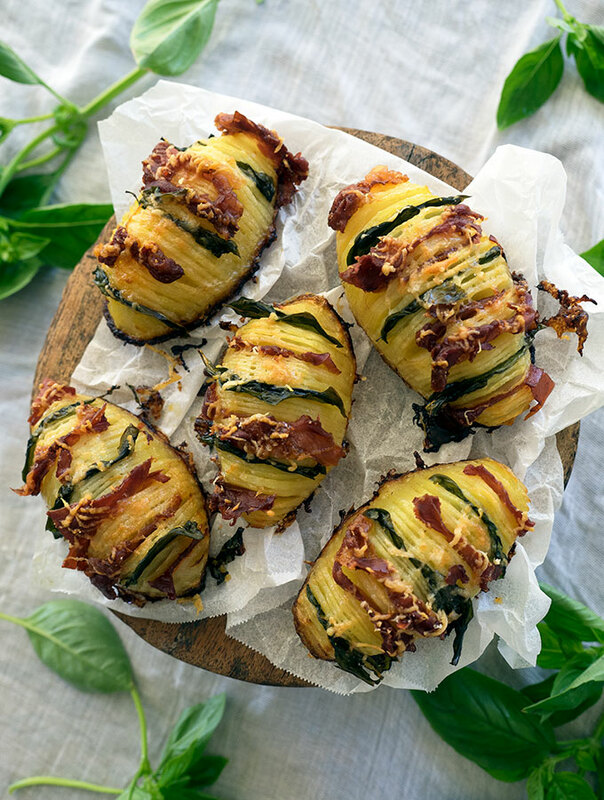 When entertaining a large group crispy hasselback potatoes are a go to recipe for me. They may sound difficult and a little time consuming, but if you follow my process from cutting board to oven, they will become your baked potato secret weapon as well. 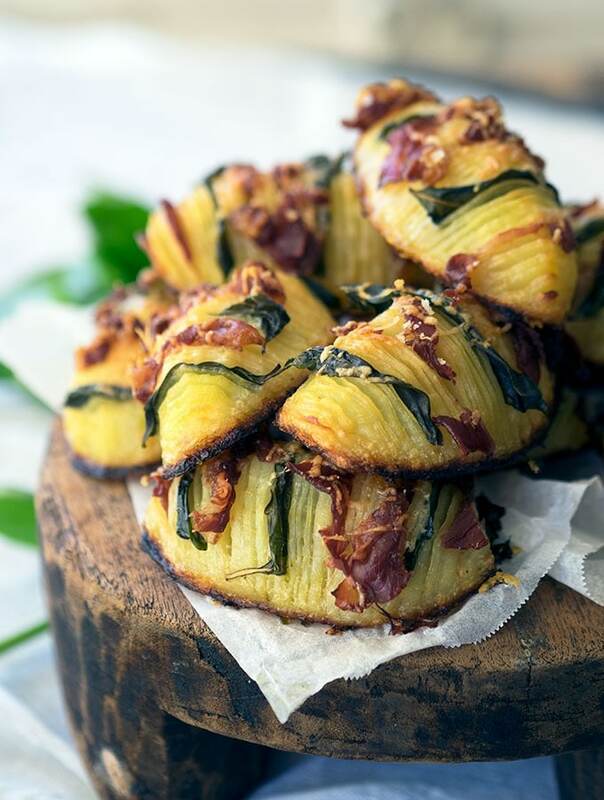 Hasselbacks are my go to if baking vegetables for a family meal as well. The crispy hasselback potatoes in the photos you are looking at are stuffed. 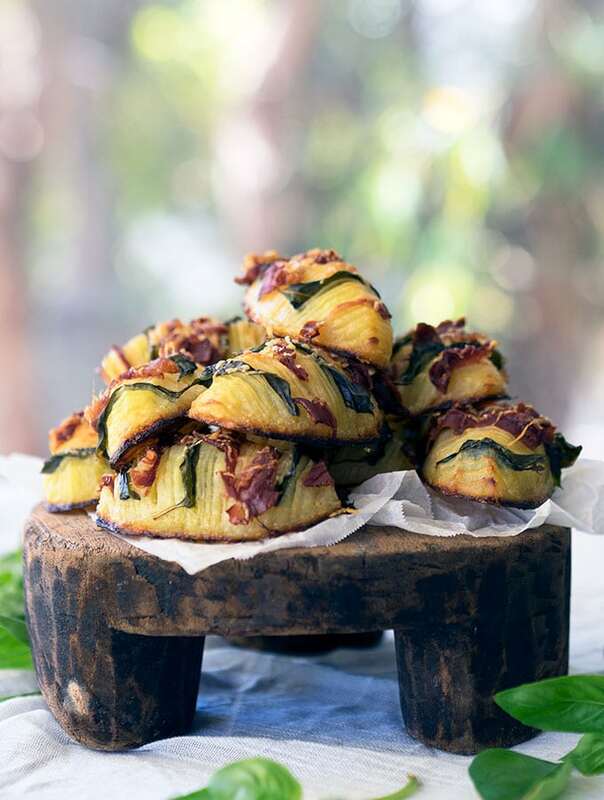 Stuffing hasselbacks are what I like to do to change things up and make them fancier for entertaining. Last Christmas I entertained family for three days straight. A small family Christmas celebration on Christmas Eve, then Christmas day we had Mac’s side of the family over to celebrate, and on Boxing day my mob came. With two rather large groups of people I served up crispy hasselback potatoes two days in a row. They look impressive, potatoes are inexpensive and if you organise yourself an easy item to add to your menu. Of course, I fed them other things as well. 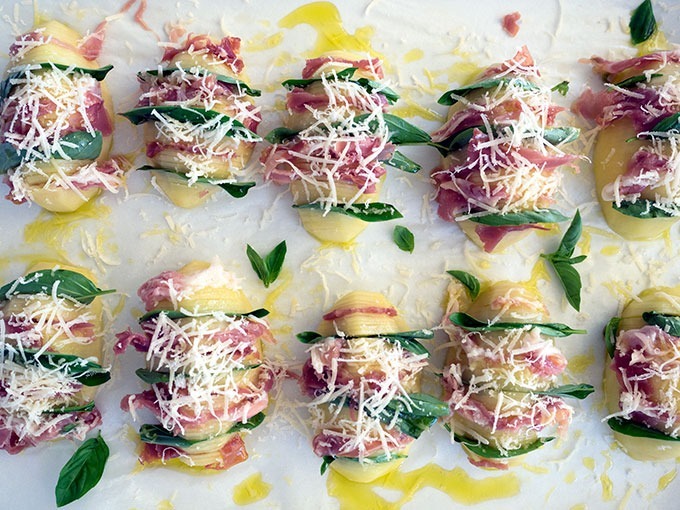 On Christmas day they were stuffed with prosciutto, basil and parmesan. These went brilliantly with turkey, ham, seafood and salad. On boxing day I went for straight old crispy hasselback potatoes, perfect with an American style BBQ. The trick to perfectly crispy hasselback potatoes when cooking for a large crowd is all in the preparation. 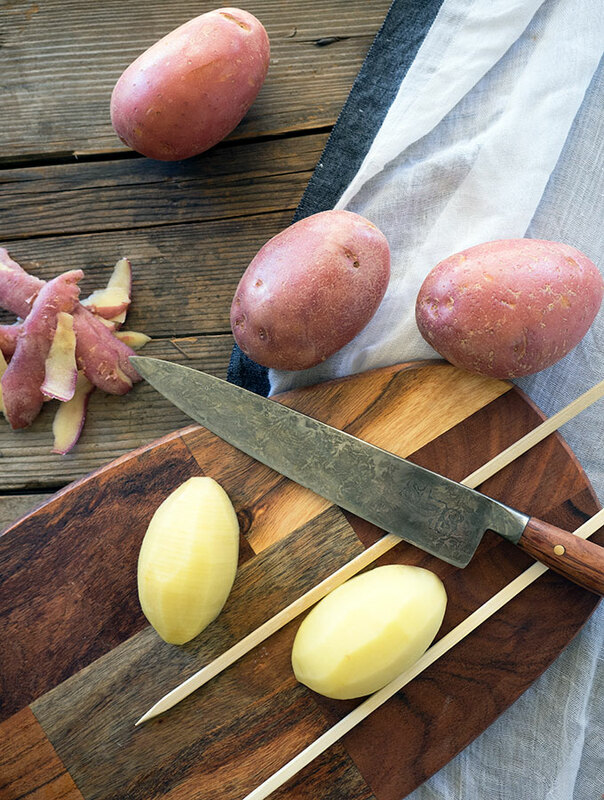 Peel and slice your potatoes well ahead of time then place them in water to stop browning. When it comes time to baking all the hard work is out of the way. It is a simple case of drain, dry, toss in oil and salt, then bake. If stuffing, it will also need to be done at this point and be a little more time-consuming. Choose a good baking potato. In Australia, we don’t have an extensive variety of potatoes to choose from at the local greengrocer. Not when you compare it to the USA and the UK where there is a vast array of potato choice. Have a chat to your local greengrocer and ask them which variety they recommend for baking if you have any doubts. In Australia, Pontiac and Sebago’s are good all-rounder potatoes. Use a sharp knife with a thin blade. Sharp knife is obvious, you should always be working with a sharp knife no matter what you are preparing. It is the thin blade which in handy. You may not have even looked at the thickness of your knife blades. When you do you will notice that some blades are thicker than others. By using a thin sharp blade it decreases the risk of breaking your potato apart when slicing into their backs. Cut the potatoes in half. Once you have peeled your potatoes cut them in half lengthwise. This gives you a flat solid base when cutting the vertical slices into the back of the potato. Use skewers when slicing the potatoes. Place a flat skewer either side of the potato half when cutting the vertical slices along the back. This will allow you to cut at a faster pace, the skewers prevent your knife cutting all the way through the potato half. You don’t have to give a second thought of how far you are slicing down. It also creates a uniformed looking hasselback potato. Dry the potatoes well. If you have prepared your potatoes ahead of time and they have been stored in water to prevent discolouration, dry them well. Drain in a large colander and use kitchen towel to dry them. Go light on the oil. If you use too much oil when baking it will have the opposite effect to what you desire. You will end up with soggy hasselbacks not crispy hasselback potatoes which is what we are after. I place some oil (I generally use light olive oil for the lighter taste) and salt in a large bowl, then toss the hasselback potatoes to give them a light but thorough covering of oil and salt. Use a baking sheet or low sided baking dish. I use a low sided baking dish, the sides are 2cm (½ inch) high. This allows for the hot air to circulate around the potatoes while cooking. Do not use a deep baking dish. Line your baking sheet/dish. Line your baking sheet/dish with baking paper. The hasselback potatoes won’t stick to sheet/tray. Plus, it makes it so much easier when washing up afterwards. Don’t crowd the hasselbacks. The same principle as using a low sided dish or flat baking sheet. If you crowd the hasselback potatoes, they aren’t going to cook and crisp up as well. By letting the hot air flow around them, you get a better result, gorgeous crispy hasselback potatoes. You can stuff them with a variety of things. Just remember that what ever you are stuffing them with will need to fit comfortably between the vertical slits in the back of the potato. My go to is basil and prosciutto. Basil leaves are the perfect size to slide between the sliced potato back. Prosciutto is also thin and easy to slide in. The added bonus of using prosciutto is that it also crisps adding an extra crunch factor to the hasselbacks. I also add some grated parmesan, some parmesan between slices and then extra sprinkled on top when they are on the tray ready to be baked. You can use any herbs you like, chives, oregano or thyme are great. Thin slices of bacon work well too. Flat skewers are preferable over standard round ones. For obvious reasons, they stay put on the cutting board and don’t roll around when slicing the potato. You can find flat skewers in some Asian grocery shops, and always in Japanese grocery shops. No real special ingredients, but as the potato is the hero, choose one that is good for baking. Store in the fridge in an airtight container. Heat up in the oven the next day, the crispy hasselback potatoes tend to crunch up again. Line a shallow baking dish or baking sheet with baking paper. Peel potatoes and cut in half lengthwise. Place a flat skewer either side of the potato half. With a sharp thin blade knife cut thin slices into the back of the potato. If not using skewers do not cut all the way through the potato. Slide a basil leaves into cut slices in the potato. One basil leaf each end and one in the middle of the potato. 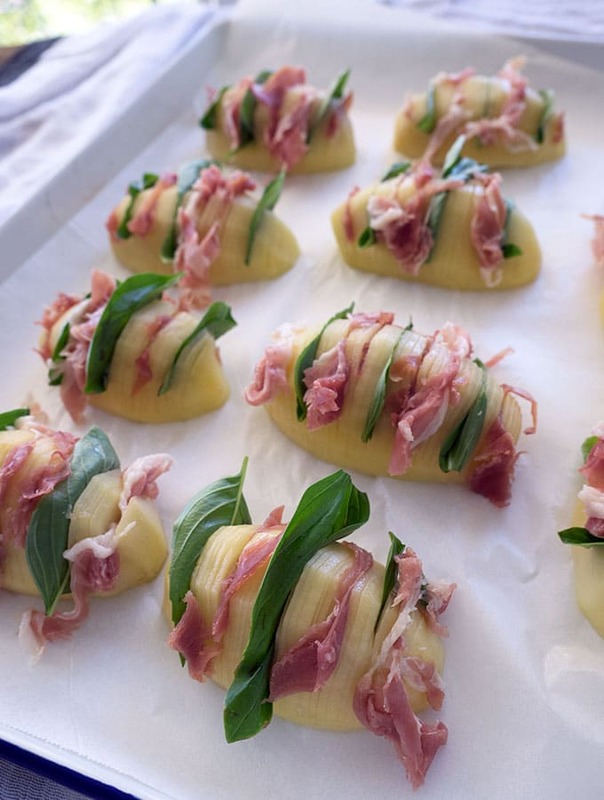 Slide a piece of prosciutto into a slice of the potato either side of the basil leaves. Stuff some grated parmesan between the slices. In a large bowl place a small amount of olive oil and a good pinch of sea salt. Toss potatoes gently, giving a light but thorough coating of oil. Place potatoes flat slide down on the prepared baking dish/tray. Sprinkle hasselback potatoes with a little more parmesan cheese. Bake in the oven for 45 minutes or until crispy and cooked through. I have to say, these look absolutely delicious! I love that you have stuffed the Christmas day ones with basil and prosciutto, plus the cheese sprinkle. So good! We love hassleback potatoes, but I never thought to stuff them. Makes them much more fancy for a dinner party or something. Now they look absolutely delicious, a wonderful side to so many dishes! I could eat a whole plate of these!! Have been looking for Christmas ideas and I am definitely giving this a go, cheers! YUM! Looks so delicious and would make such a great side dish! I’ve always wanted to try making these but thought they might be a bit difficult. Thank you for the tips! I’ve always wanted to try making these but thought they might be a bit difficult. Thank you for the tips. I know my family would love these!